I am generally a morning person – I am usually up well before 7am without an alarm and do my best work before lunch time. Starting my day at 4am was just too much though, even for me. We passed over the border into Albania at about breakfast time, and by about 9:30am we were pulling up at our first location, the capital, Tirana. 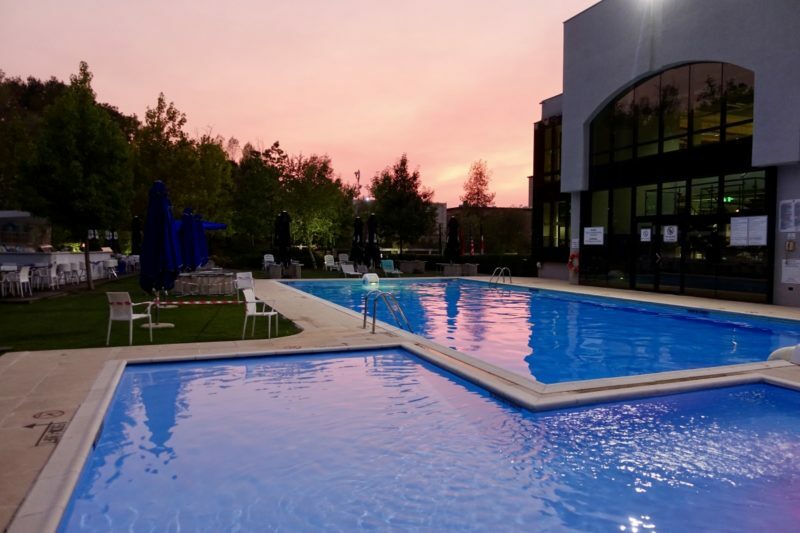 Thinking back about Tirana, my overwhelming memories are of the heat, and the pool at the Sheraton, where we stayed! It was in the high thirties the whole time we were there and since it had been hot for weeks we were starting to be really exhausted by it. Staying at an amazing five star hotel was exactly what we needed. This part of our trip would have been a very different experience if we were in a hot hostel. Most days we were out and about in the mornings, and by mid afternoon we were back at the hotel, enjoying the pool. Once we were revived and it had cooled down a little we often went out again in the evenings. 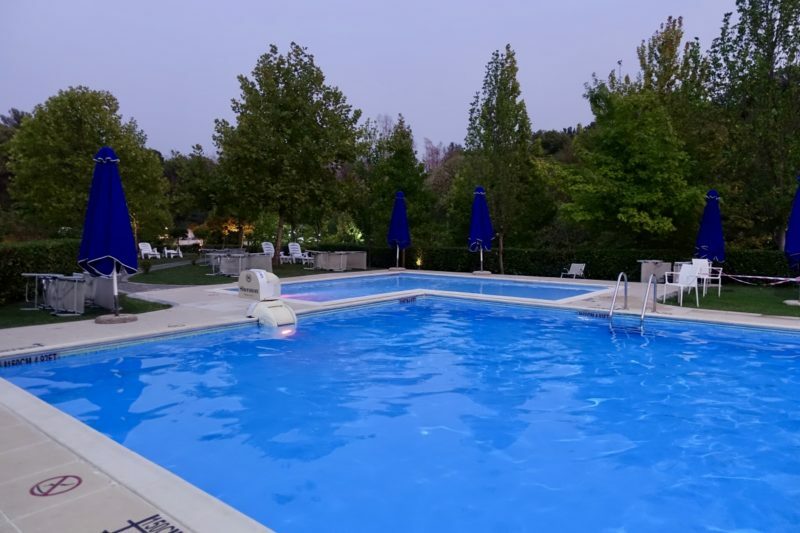 The pool at the Sheraton in Tirana. On our first evening we did a free walking tour to get our bearings and learn a little about Albania. I knew very little about the history of Albania, and our guide was knowledgeable and interesting. 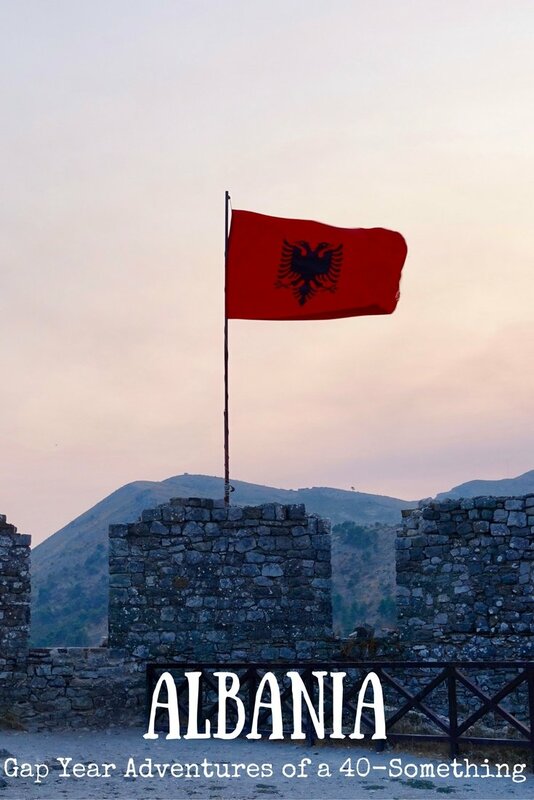 It says a lot about just how badly the Albanian people were suppressed and indoctrinated under communism that when they were given the chance to vote in free elections for the first time they again voted the same people back into power. 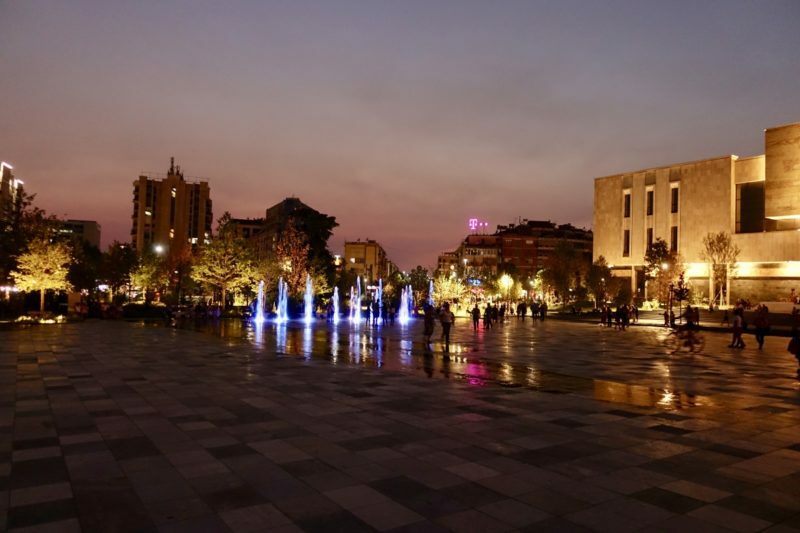 Skenderbej Square as the sun goes down. Water is continually run over the square as a water feature and to help keep the area cool. 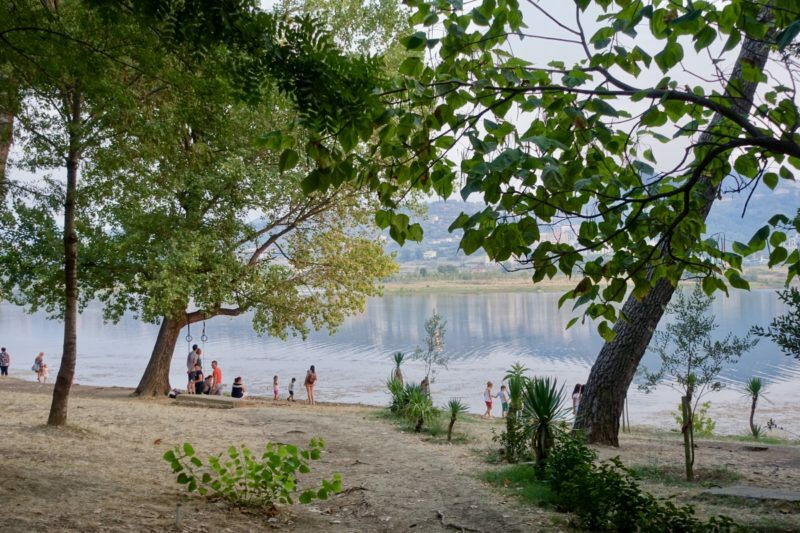 Since the fall of Communism, things have been tough in Albania and there seemed to be varying levels of hope amongst the people we spoke with. There is a lot of building going on in Tirana, but mostly people were excited that a new stadium is being built. Not only are they looking forward to watching their favourite teams play football in a brand new venue, but now they can have concerts and other events. The next biggest venue where concerts are held now has a capacity of only 2500 people. Right next to the stadium another five star hotel is being built. This will be the fifth in a city of 800,000 people. As the city modernises, it is still possible to see some of the remenants of communism. 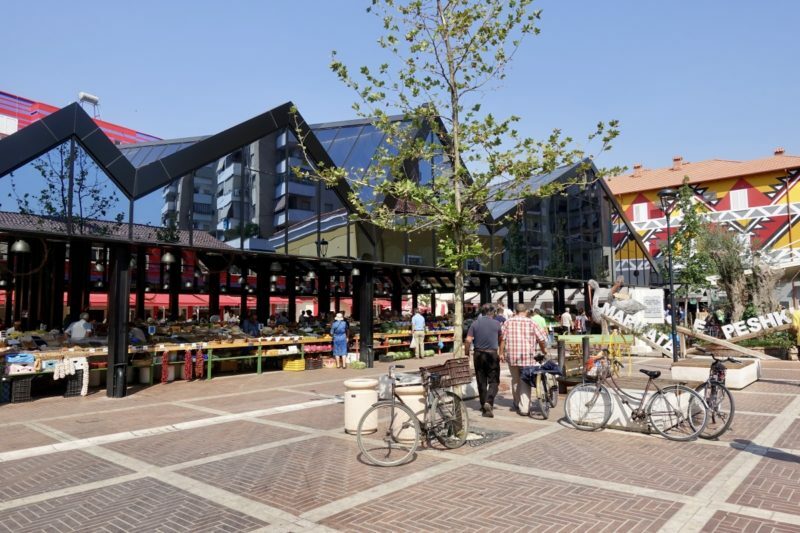 One of the most visible is the Tirana Pyramid. 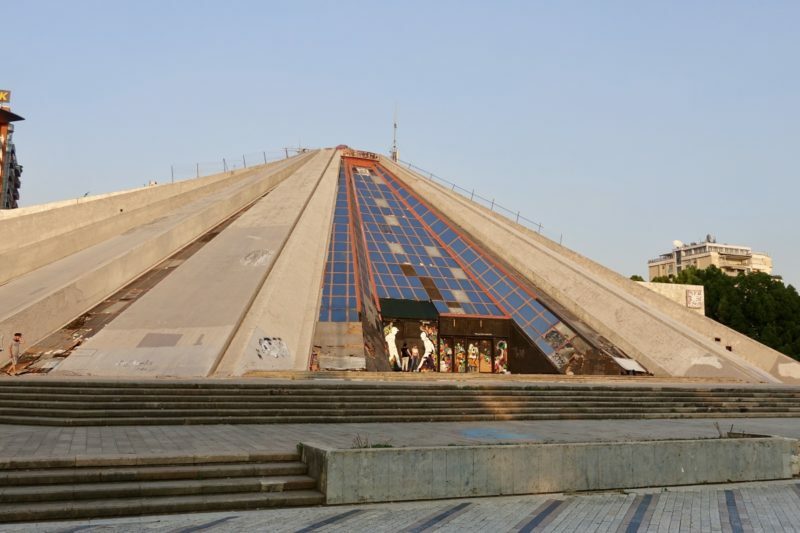 This was originally built as a museum to the leader (and dictator) of Albania during the communist years, Enver Hoxha. The museum was dismantled after communism ended, and the building has been used for various things since. Now it sits empty, awaiting a decision on whether it is to be demolished or refurbished. The former home of Enver Hoxha and his family is in a similar state. There is still dispute over whether the house is owned by the state or by the Hoxha family. In the meantime, it sits in disrepair in one of the best locations in the city, the now trendy neighbourhood of Blloku. It’s a little bit ironic that right across the street from the tyrannical leader’s house is where the first international fast food restaurant has opened. It could only have been better if it was McDonalds, instead of KFC, that represented this influx of western culture. 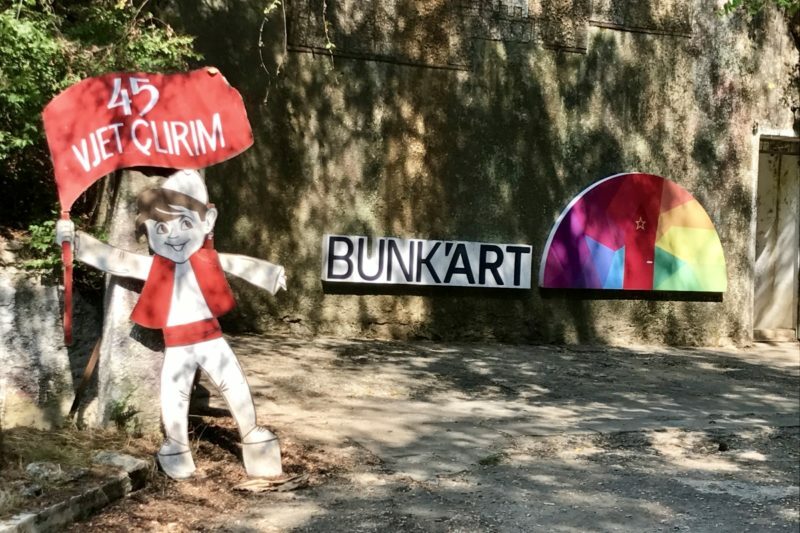 There are many museums in Tirana, but we were looking for something a little bit different and unique, and the Bunk Art museums are just that. The first one was built in a bunker in the foothills on the edge of the city and it was to be the place Enver Hoxha, his family and prominent decision makers would retreat to in the event of an attack. Hoxha died before it was completed though, and it was never used as a bunker. Some of the rooms are still set up as they were at the fall of communism, including Hoxha’s rooms. Many other rooms are used to display photographs, letters, and other memorabilia relating to the communist years. While being underground was a welcome respite from the heat, it felt a bit claustrophobic. I’m not sure if this was some of the subject matter, or the lack of air circulation. The entrance to Bunk Art. Unfortunately no photos were allowed inside. Getting to Bunk Art can be a little daunting, but in the end we found it quite easy. 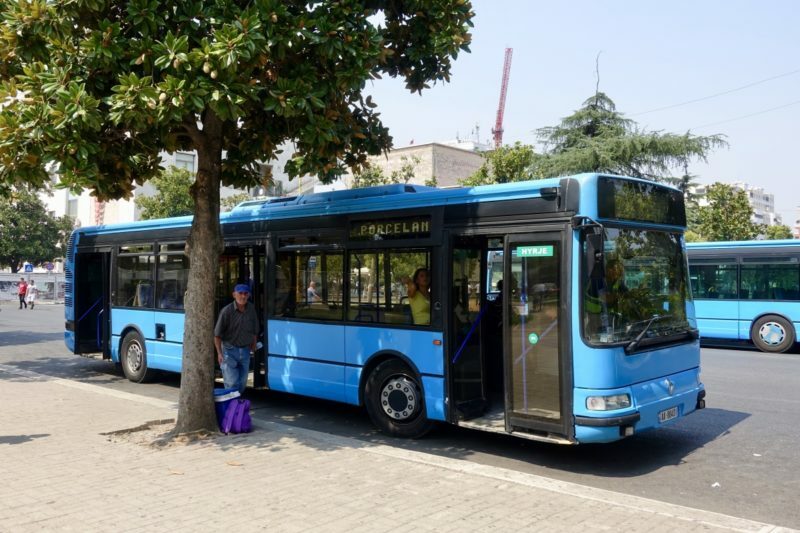 The buses in Tirana are colour-coded, and the blue bus you need stops on the street behind the old mosque on Skënderbej Square. The fare is 40Lek ($0.45AUD/€0.30), and is paid to a conductor on the bus. I had seen some reports that it was a few minutes walk from the bus stop to Bunk Art, but the bus we were on looped around and stopped only a few metres up the road. Get off the bus and walk back the way you came. If you are unsure, ask the conductor, he will help you. The one on our bus spoke little English, but enough for us to understand each other. 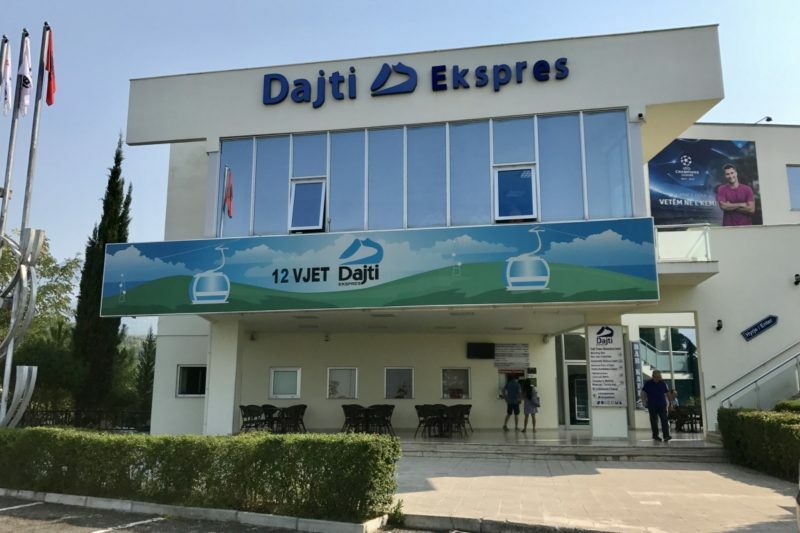 The same bus and final stop will also get you to the Dajti Ekspres Cable Car. Just turn left as you get off the bus, take the first street to the right, and it’s about a five minute walk, up hill. We had timed it so that we arrived here at 10:00am, the opening time for the cable car. As we walked up the hill, someone coming down said “No cable car. No electricity”. Sigh! We continued to walk up, and asked the security guard if we could just go in to take a few photos, and he was okay with that. I am not sure if the problem was the electricity, because some things seemed to be working, but clearly the cable car was not and people were being turned away. The cable car building. You can’t miss it. We were not having a lot of luck in Tirana. A couple of days earlier we had planned to visit the nearby coastal town of Durres to spend some time on the beach. Our hotel told us not to go, because that day the President and lots of ministers were in Durres having a big meeting with members of the World Bank and all the roads were closed off for security reasons. We would have found ourselves in a never-ending traffic jam, and probably would have reached Durres just in time to go back to Tirana. Many of the World Bank delegation were staying at the Sheraton, but that was not the cause of the media scrum the next day. We had to run the gauntlet of reporters and tv cameras as we were trying to leave in the morning. Now I know what it’s like to walk the red carpet! The cameras stayed all day, and when we asked our favourite concierge what was going on, it was some sort of political party voting being held in the ballroom. After that excitement, we made our way to Bunk Art 2. 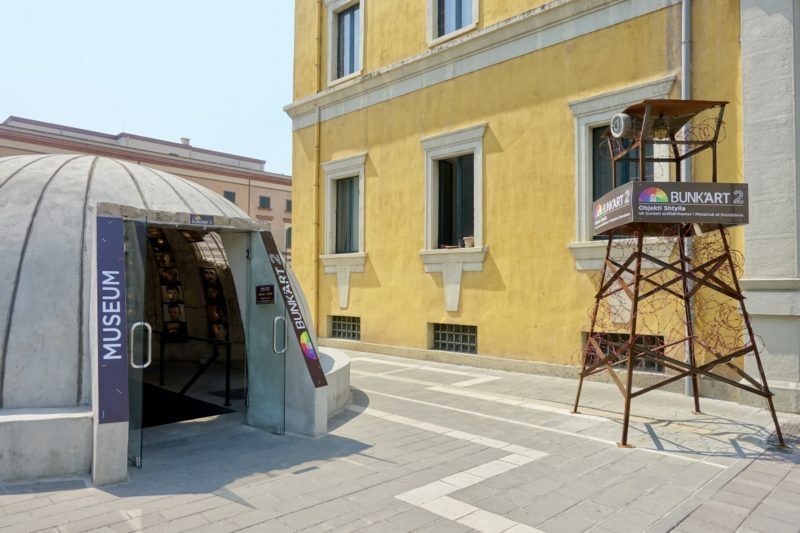 These bunkers are in the centre of town, and are so much easier to get to and visit if you are short on time. The focus here is on the history of the Ministry of Internal Affairs, which incorprated the political police who inflicted all sorts of atrocities under the Hoxha regime. While there is a seperate museum on surveliance, there are also displays here that show how people were spied on and how they were persuaded to give up information. The entrance to Bunk Art 2. gain no photos were allowed inside. The location of these museums in the bunkers and tunnels under the city, while emotionally charged, is also convenient. During Hoxha’s rule, more than 175,000 bunkers were built throughout Albania. They are everywhere. This is a practical way to use them rather than leaving them empty. 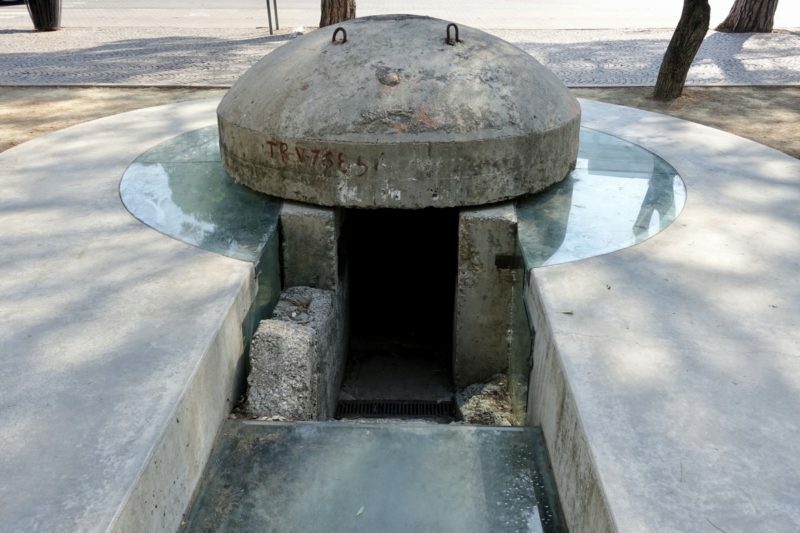 One of the many bunkers on the streets of Tirana. This one has been purposely left open to show what they are like. 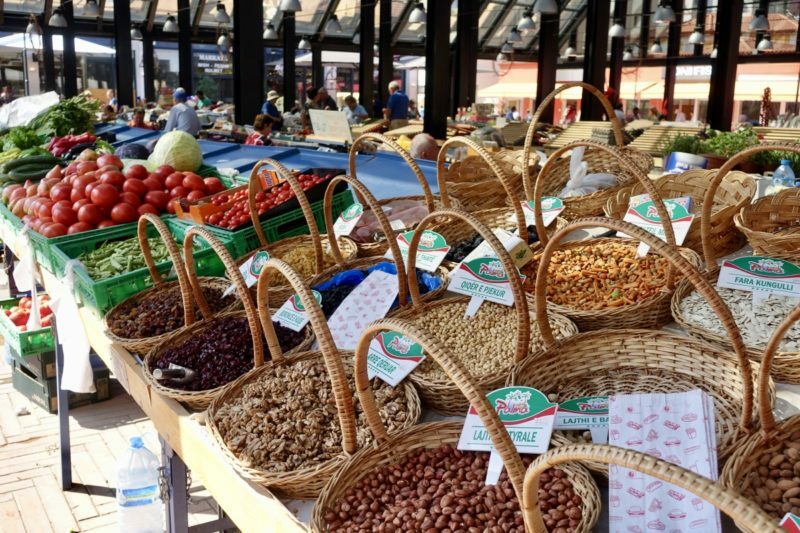 One of our other mornings was spent exploring the rejuvenated markets. There is a lot of colour and noise as the sellers go about spruicking their wares the same way they have done for hundreds of years. 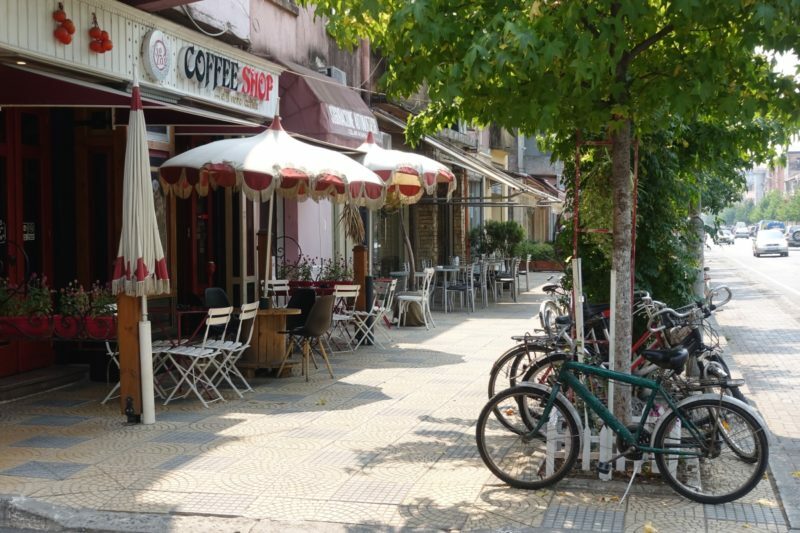 Cafes and coffee shops abound, and this is an area for socialising as much as shopping. 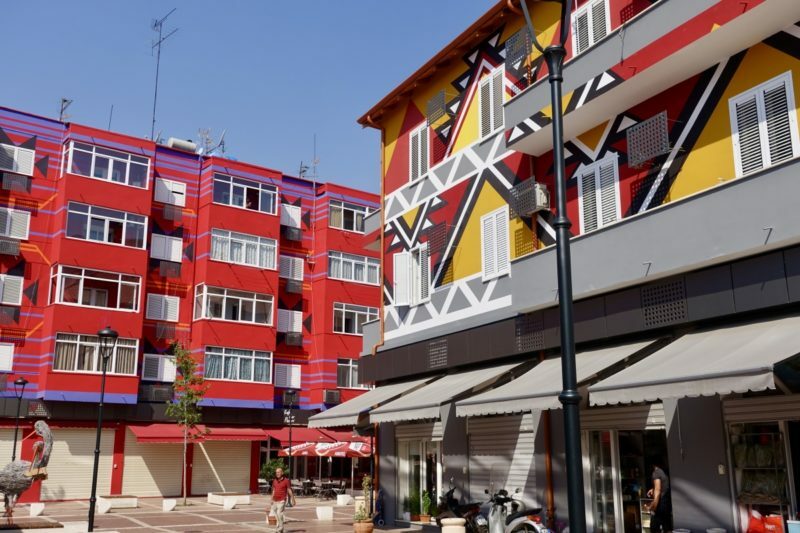 Here is a good example of some of the colourful buildings popping up all over Tirana as the city is slowly modernised. Mostly in the evenings when we went out we would find a resaurant for dinner, enjoy a meal and a couple of drinks, and soak up the warmth and the atmosphere. Our favourite evening we went up to the Sky Tower for a drink and icecream as the sun was going down. 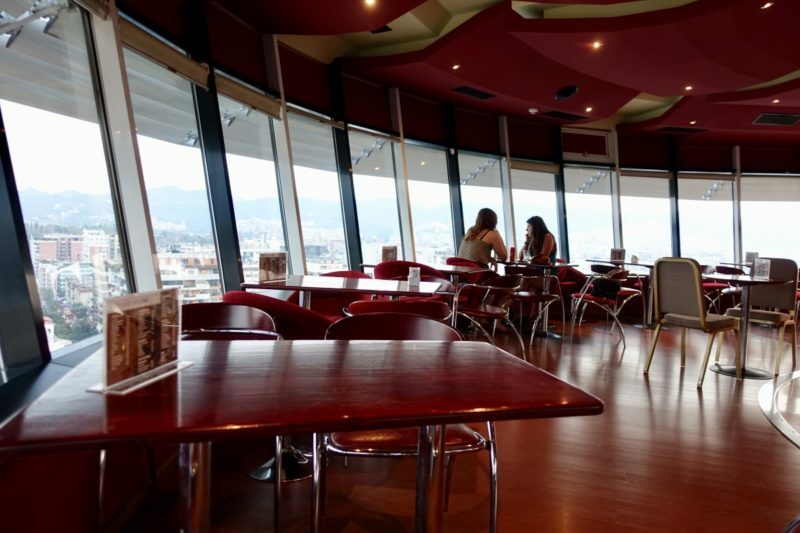 We got some great views over the city to the mountains beyond as the restaurant rotated around to give us the full 360 degree view. Sky Tower is in the Blloku district, which is where we ate most nights. Not only was it convenient to the Sheraton, it’s the location of most of the funky new bars and restaurants in the city. Right behind the Sheraton is a huge city park with a man-made lake. 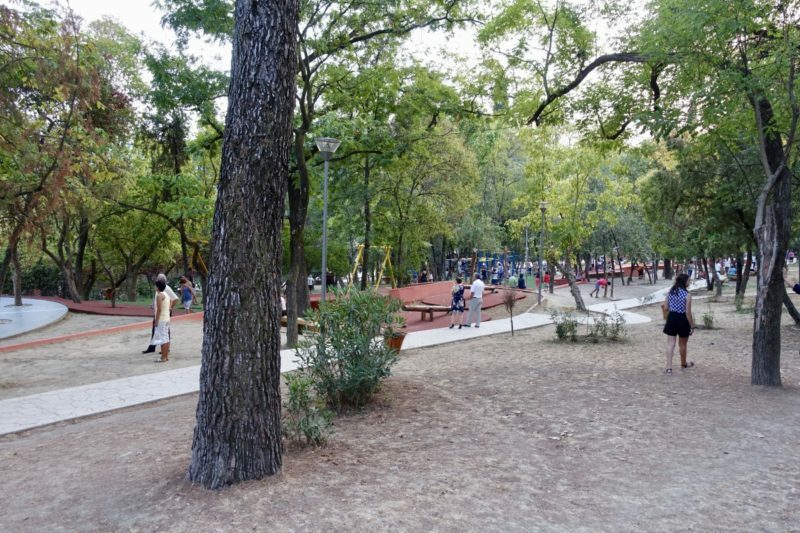 We went for a walk through the park before dinner, and were absolutely amazed by the number of Albanians out enjoying what I have to say are extensive facilities. There are multiple different sports equipment, from basketball rings, to a small soccer pitch, gym equipment, and even table tennis tables. Playgrounds for the kids stretch for hundreds of metres, with a small train too. A few people were fishing in the lake – but I didn’t see any fish being caught. On the other side of this park is a zoo, which we were told was also being rejuvenated. I’m not sure I would visit anytime soon, but perhaps in a few more years it might be of interest. 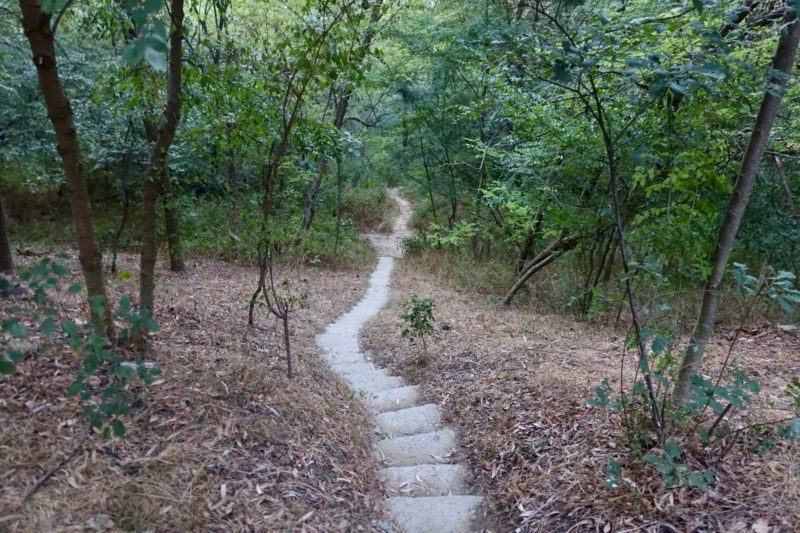 As we walked back to the Sheraton on a different path, it was like we were no longer in the city. There were only a handful of people to be seen, and much of the usual city noise could no longer be heard. There are not very many places in this busy city where that can be said I’m sure! 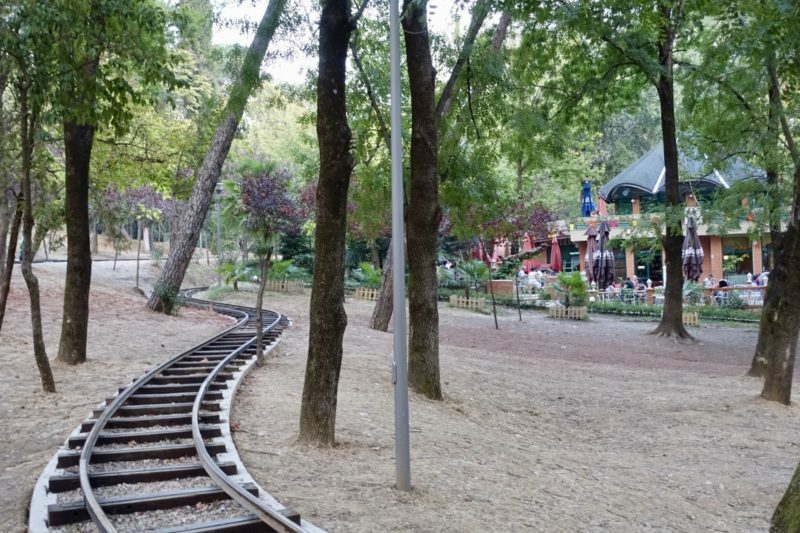 The railway line for the little train and one of the many cafes in the park. 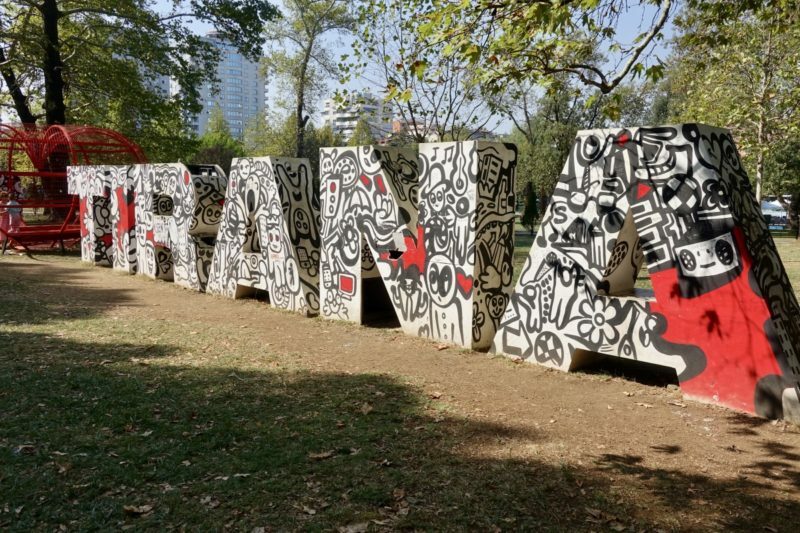 Apart from the heat, Tirana was a comfortable, friendly city to visit. 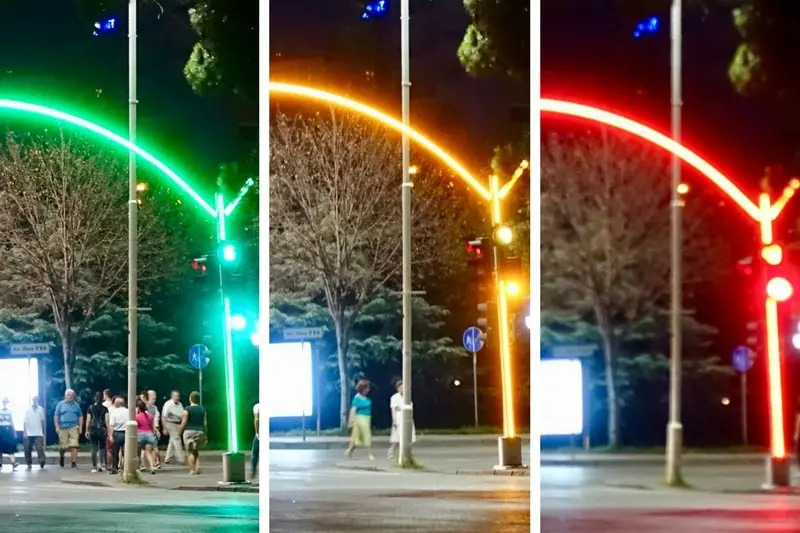 We felt safe walking on the streets at night, and I loved the traffic lights up and down the main boulevard. This is another place we would be interested to visit again in five or ten years time, to see how all the building works change the city. 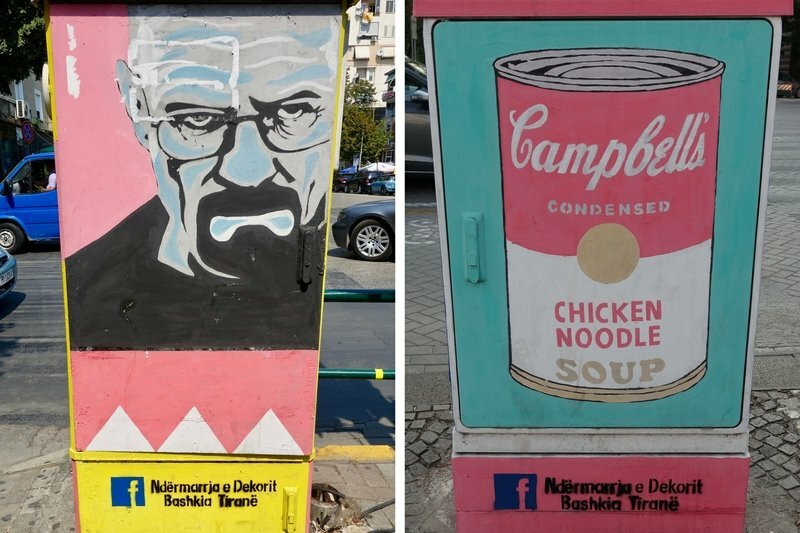 All the electrical boxes in Tirana are decorated with artwork like these. There are more than a hundred different ones. We discovered though that TIrana is a tricky city to leave. On our first attempt, we decided to go with the cheap option, a furgon. These minivans run around the countryside any time of the day or night. The idea is you find the one going where you want to go and get in. Once it is full, off you go! As we arrived at the furgon station, Simon and I swear the guy yelled out Shkodër. We repeated it back, all was good, so off we went. It wasn’t too long before I thought, hang on, we should have turned there, but I thought maybe we were doing a detour through the coastal town of Durres. I voiced my doubts to Simon when we had been heading south for about ten minutes without any sign of stopping. This did not seem right. By the time the bus stopped and we could question the driver, we were about 200km away from Shkodër in the wrong direction! The driver of course swore he asked us if we were going to Vlores. Now how we could get that and Shkodër mixed up I am yet to figure out! 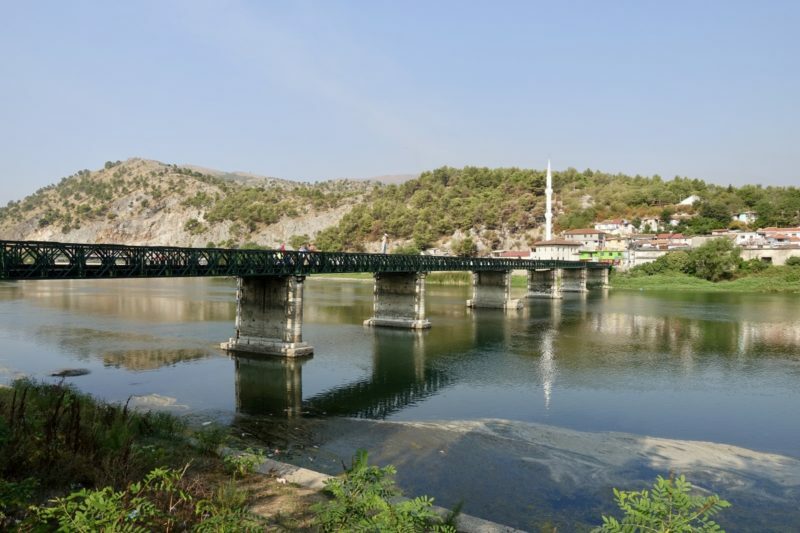 The driver also was able to suggest his Uncle’s guest house for accommodation in Vlores, and he was so sorry there were no buses to Shkodër that day! 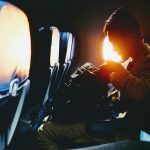 He was disappointed when we jumped in another furgon and went straight back to Tirana. Now I couldn’t swear that he purposely mislead us, after all, on further inspection we had incorrectly gone to the Vlores Furgon Station, from where all the cars went to Vlores, but, like I said, how did we mishear Vlores for Shkodër?? We did it all again the next day, and arrived safely in Shkodër by car, with various other passengers jumping in and out along the way. We shared the backseat with a mother and child, all tightly squeezed in to bake for the two hour trip. This unofficial transport system can be very efficient, if you can figure out how to work it! 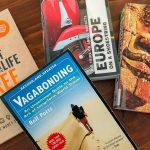 This is all part of the experience of travelling, and we will cherish even these challenging days. Just arriving in Shkodër was a relief! But it was also lovely to arrive at our relaxing and comfortable accomodation, Hotel Vataksi. We spent the afternoon sitting by the river and catching up on our blogs. Due to our messed up travel, we now only had one full day in Shkodër. We were out early to do the trek into town. Where we were staying we really nice, but it was quite a way out of the centre. We could have grabbed a taxi for only a few dollars, but decided to walk instead. It’s the best way to get to know a new place. And that’s exactly why our first activity was a free walking tour. 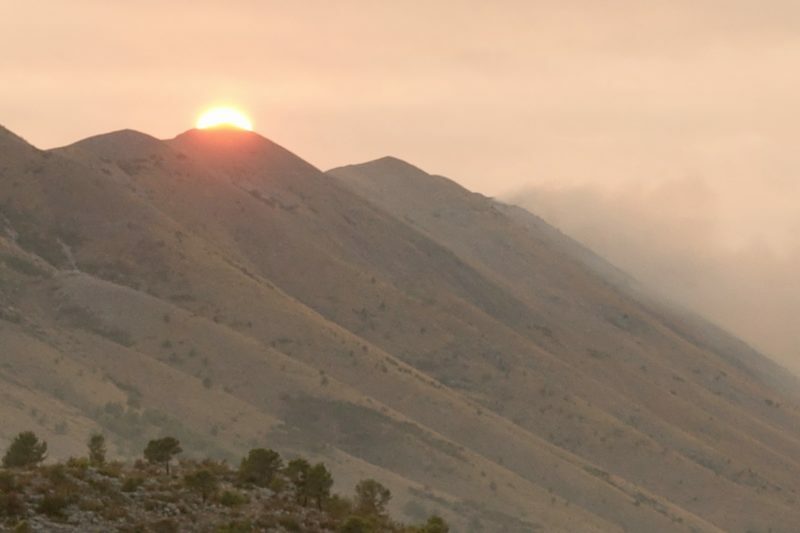 The tour was run by an American girl who came to Albania as a volunteer a few years ago, and has now married an Albanian and is staying in the country. Her tour was interesting, particularly because as she is not a native Albanian, she instinctively knew what we, as foreigners, would be most curious about. 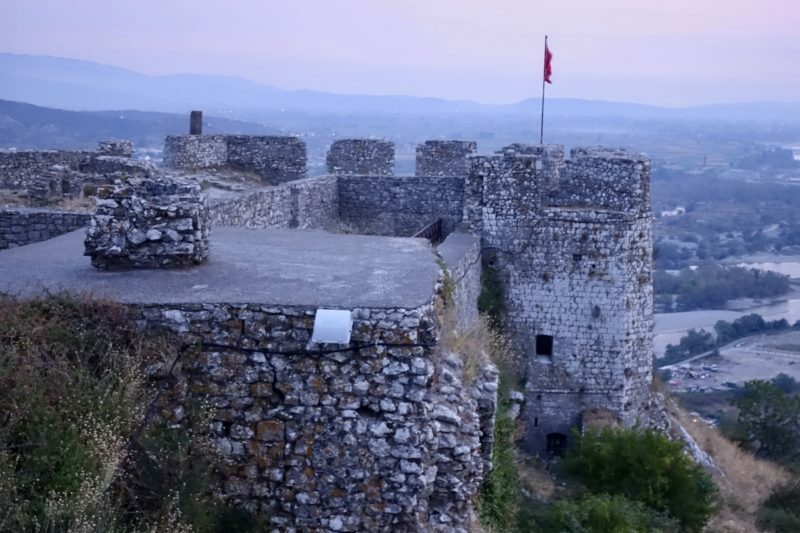 To be honest, Shkodër doesn’t have a whole lot to “see”, but there is a lot of interesting history and stories. We spent much of the rest of the afternoon having lunch in town and wandering around the streets some more, before making the long trek back to where we were staying. After a quick rest, we were back walking, this time just across the river to the Rozafa Castle. We were meeting a guide here for another walking tour around the castle, during which we would see the sunset from high above the town. Shkodër had a surprisingly prominant place in the Roman history of the area, right up through to when Albania gained it’s current boundaries in 1912. Part of Razafa Castle from the ramparts. As the sun started to go down, we got a little distracted. Firstly by the sunset itself, and then by another red glow. On the hills in the distance a forest fire was burning out of control, and the brisk winds were helping it along quickly. I was surprised that our guide seemed unconcerned when we pointed it out. I wondered if this was common place in the area. 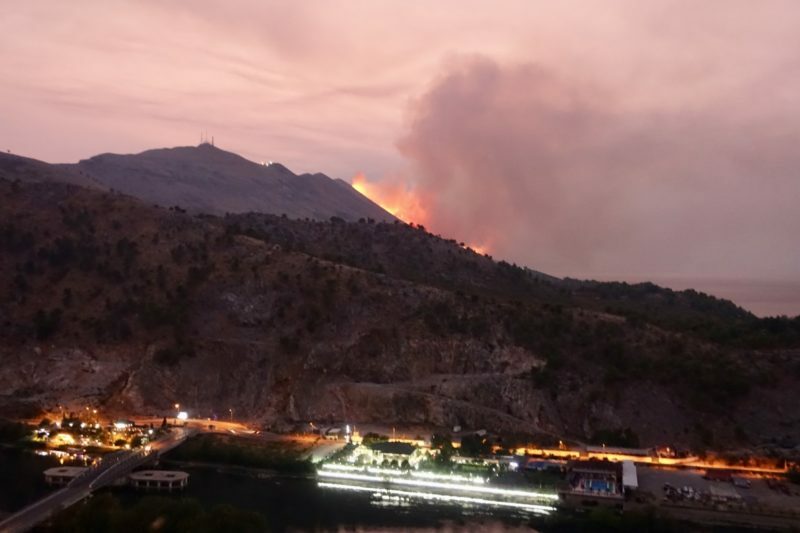 From the top of the castle we could see these bushfires burning about 15km away! We made our way back to our hotel, and asked for a taxi for the morning, and we were met with blank looks. We did not realise that night was the beginning of Eid. This Muslim celebration goes on for four days, and we were told they would TRY to get us a taxi. In the morning there was no one around. It was like the whole place was deserted. This was not the first time on this trip we had come across a holiday we hadn’t planned on. With no one to ask, we packed and set off on the long walk into town to catch the bus with all our backpacks on. We left about 8am, so at least it wasn’t hot, and in the end, the walk was not as bad as I had thought it might be. With our last brush with Albanian transport, it was a relief to see our bus show up only twenty minutes late, with seats available, and going in the right direction! So Albania might not have been the easiest country for us to travel in, but it was no means impossible. I am glad we came here as I really learnt so much about the country, the people, and even my own ability to problem solve. I enjoyed exploring and the country was safe. I had heard beforehand that Albanian men could be very sexist and give unwanted attention to women. I am happy to report I did not feel uncomfortable at all. Admittedly I was with my husband for the majority of the time, so that probably helped, but I thought it was still worth mentioning. As with the other Balkan countries, Albania was really cheap. 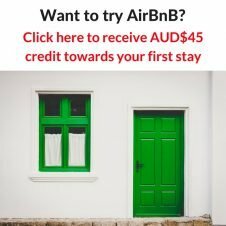 It was still easy to get a meal for both of us including a beer or wine each for $10-$15 AUD (€7-€10) . Transport was cheap – it cost us about $8AUD (€6) to get between Tirana and Shkodër, and we didn’t negotiate the price. I am fairly sure the locals got it cheaper, but we were happy with it. Transport was a challenge! The hardest part was getting two answers the same. I would ask someone a question and they would point one way, ask someone else and they would point in the opposite question. Yes, there was a bus, no there wasn’t. We just accepted we would just have to go and see for ourselves and be prepared to wait. The local bus in Tirana was cheap, and once we found out what colour it was it was easy to find. I am not sure what it would be like to get somewhere else in the city. Wifi was great at the Sheraton, as is to be expected. 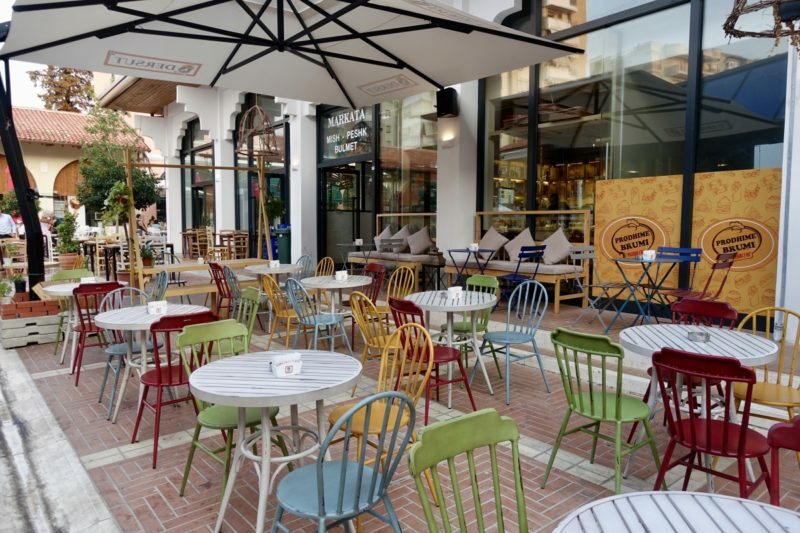 Many cafes and restaurants had it throughout Tirana, but the quality was sometimes a bit sketchy. 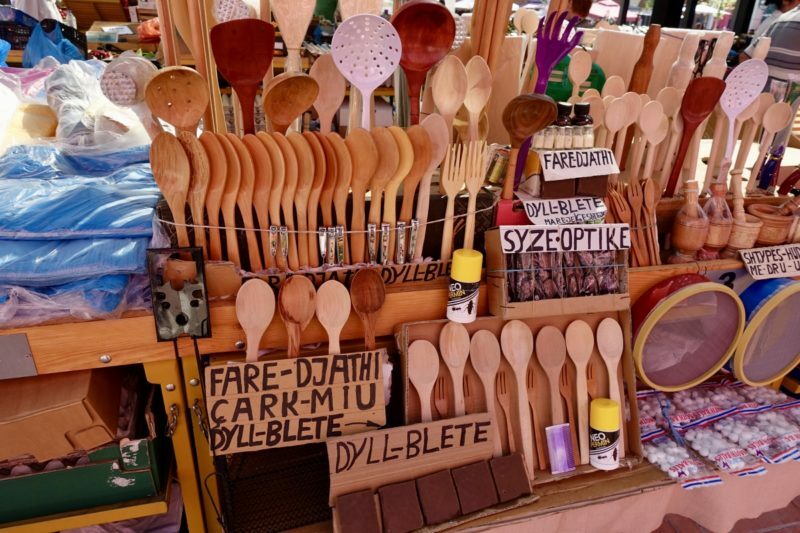 Shkodër was also of varying quality, but as we were not there for very long, we mostly only used it for essential things and waited until we moved on for anything else. The Albanian sunsets were amazing. This one over the Sheraton pool where we spent most afternoons. Thanks Carol. Would you believe I haven’t seen them anywhere else, but when we got to Bodrum two days ago, there they were again! Loved reading it and I liked your narrative. Hopefully I will get there someday. I’ve been wanting to go hiking in Albania for quite some time – hadn’t considered visiting the capital but thank you for sharing your experience. 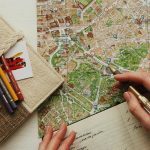 I will definitely have to check out some of these places! Thanks Eleonore. 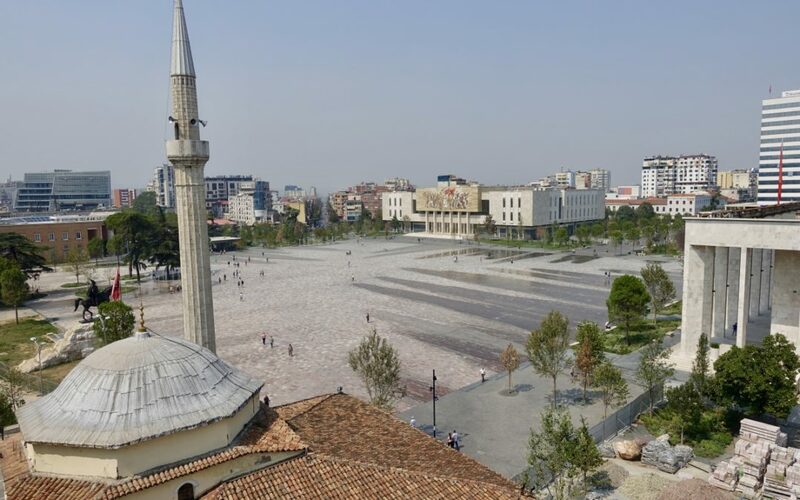 It’s worth visiting Tirana for some of the history alone. Albania looks very interesting! It is definitely on my list. Glad to hear you felt safe in Albania. 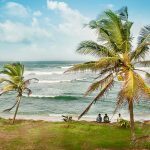 Would you recommend Albania for solo females? In Turkey I felt very uncomfortable at times as local men were quite intense. Thanks Piia. 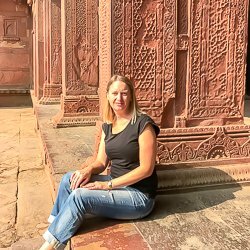 It’s hard for me to comment on solo female travellers because I wasn’t one, but I did meet quite a few girls travelling on their own on the walking tour. None of them mentioned feeling uncomfortable, so I hope that is a good sign.